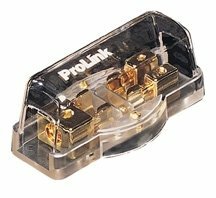 ProLink¨ gold-plated distribution fuse blocks incorporate brass blocks with high tension grip clips to insure a constant flow of current. Each output is independently fused and accepts MAXI series fuses. Display packaged. One 4g input and two 8 or 10g. outputs. Current capacity 60 X 2 = 120 Amps. If you have any questions about this product by Prolink, contact us by completing and submitting the form below. If you are looking for a specif part number, please include it with your message.